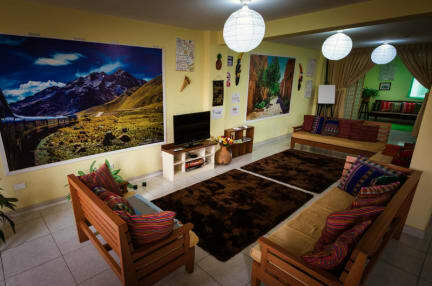 Mama Backpackers is a cozy and functional hostel that will permit you to experience and enjoy Lima and Peru. We do our best so that you can feel exactly like home, providing FREE BREAKFAST, a large common space is available to get to know with your fellow travelers, watching movies, TV, playing game tables or reading a book. We love to enjoy the company of people from all around the world in our humble house and keeping this local and family atmosphere that each traveler is looking for. Mama Backpackers is situated Los Olivos which is the safest and closest district to the airport which is ideal for stopovers, layovers and early morning flights. The Airport of Lima is located 15 minutes way by car, meanwhile it is possible to get several bus connections to go to the center to discover and enjoy some of the finest landmarks of Lima such as Plaza de Armas, Cathedral of Lima and Estadio Nacional del Perú, amongst other interesting spots of the city. We do not forget our smoker friends so you will find a nice and green roof top so that everyone, smoker or not, can chill out and sipping a beer. We only accept SOLES, exchange offices are available at 1 minute from the hostel. No credit cards accepted (ATM also available and close to the hostel). The reception service is open from 06.00 to 24.00. Important: Guests under 18 years old are not allowed. Late Check-in are possible anytime, let us know as soon as you have booked your bed. Be aware that the most friendly cats live in the property. For security reasons people who are not staying in are not allowed to enter in the property. 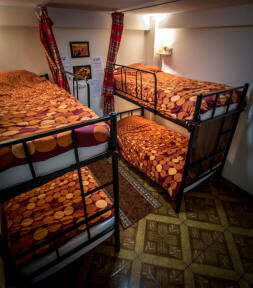 Lockers are available with no charges, Mama Backpackers declines any responsibility in case of lost. Mama was an absolutely amazing hostess! She was so friendly and answered the door for us even though we arrived just before midnight. She cooked us breakfast and even knocked on our door to make sure we didn’t miss our flight to Cusco. She also called a taxi for us and it arrived at the time we needed to leave. Stay here! We certainly will. Ideal for our purposes. Carlos picked us up at 2am from the airport. We had a great sleep, hot shower and satisfying breakfast. Helpful advice for atm and onward travel. Would highly recommend. Mama is amazing! Very friendly and the place is very clean! Loved Mama and her hostel! Such great service. It felt like I was staying at an Airbnb or bread and breakfast. The breakfast was phenomenal with homemade bread, freshly squeezed orange juice, and eggs. Plus coffee, tea, fruit, and as much bread or fruit as you’d like. Only downside is the location. Not a place I’d want to walk around alone at night. But Mama’s Backpackers was by far the best hostel I have ever stayed at. Mama was an incredible host! I didn’t get to the hostel until 2 am and she was up waiting for me to arrive and let me in. Showed me around the hostel and what not. Following morning had a great breakfast. Eggs, fruit, juices, etc.... then she was very helpful in helping me arrange an UBER back to the airport. Felt like she was my mom haha. Best hostel I’ve stayed in by far. The hospitality of Mama was incredible. She made the atmosphere very cozy. Delicious breakfast with homemade bread and orange juice. Felt very much like a home away from home. Quite relaxing and away from the tourist hub so you get more of a real sense for a Lima neighborhood. Will be returning again near the end of my trip to relax! Ideally located close to the airport and they offer airport pick-up too. We had a private room, bed was comfortable and shower was hot! Great terrace and common room. Really enjoyed the free breakfast too. Kitchen is a little basic but there's loads of places to eat in the area and a massive supermarket down the road. Lots of banks and pharmacies too. Would definitely stay here again. Mama was incredibly nice and accommodating, and the free breakfast was great. Very cool common area and the cats that roam around the building are very friendly. The location is very close to the airport but a bit of a drive from Miraflores or other touristy areas. This is the perfect hostel if you want to stay close to airport. We stayed there for one night since we had flight out Lima the next day back home. You feel like you're at home so for sure not a typical hostel. Although the location is not a touristic location, Mama gave us recommendations on where to grab a bite and arranged transport from and to airport. If you want to close to the downtown or Miraflores then this is not the place. Overall we felt very welcome and the breakfast was very good.